Soul songs aren’t typically part of the Hanukkah tradition, but who says holidays need to always stick to the same celebrations? With a smooth, swinging funk, “8 Days (Of Hanukkah)” kicks off Sharon Jones & The Dap-Kings’ ode to the season, a record that’s refreshing and unique, shot full of the personality and creativity that have made Jones and her band a neo-soul sensation. Like Nick Lowe’s 2013 Quality Street: A Seasonal Selection for all the Family, this is a holiday album that eschews the formula, with fresh original songs capturing more of the true essence of the season than a by-the-numbers pop set of warmed-over Christmas standards ever could. As far as standards, “Silent Night” gets a slinky, bluesy treatment, the re-titled “Funky Little Drummer Boy” becomes a rhythmic triumph, “Silver Bells” pops with gospel energy and joy, and “God Rest Ye Merry Gentleman” is arranged as an instrumental, laying the familiar melody on the band’s horn section, which kicks down some some jazzy flourishes. The album’s standout track is “Ain’t No Chimneys in the Projects,” a reminder that Santa’s magic isn’t reserved for America’s picket fence neighborhoods. Underscoring the song’s witty lyrics is a message about the power of parental love and protection to pave over difficult times with fond memories. Two more Sharon Jones & The Dap-King originals, “Just Another Christmas Song” and “Big Bulbs,” were originally released as a limited 7-inch vinyl single in 2014, creating the up-tempo, party-making template for the full-length release. There’s an all-too-short list of all-time classic holiday soul and R&B albums, and It’s a Holiday Soul Party is a contemporary gem that sits comfortably alongside 1963’s A Christmas Gift for You from Phil Spector and 1970’s Jackson 5 Christmas Album at the top. 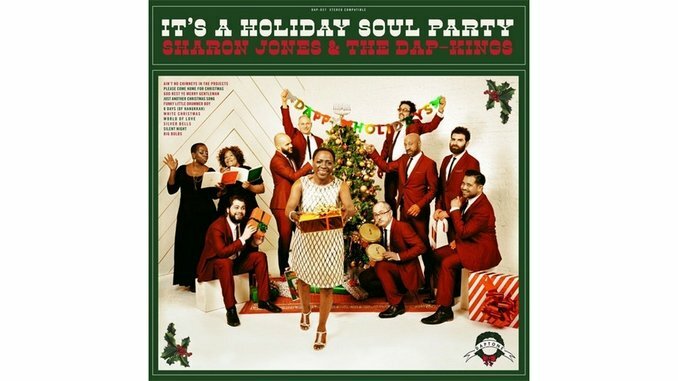 In the hands of Sharon Jones & The Dap-Kings, a Christmas album can be a party unto itself, surpassing mere tidings to bring an actual jolt of comfort and joy.